In typical development, we expect that by about 12 months of age, our babies will be able to pinch small objects using the tip of the index finger and the thumb. This is the result of all the early movement and play experiences they have experienced since birth. Once your baby can use a pincer, or pinch grasp, he will be more successful with finger-feeding, and even more motivated to use a spoon by himself. 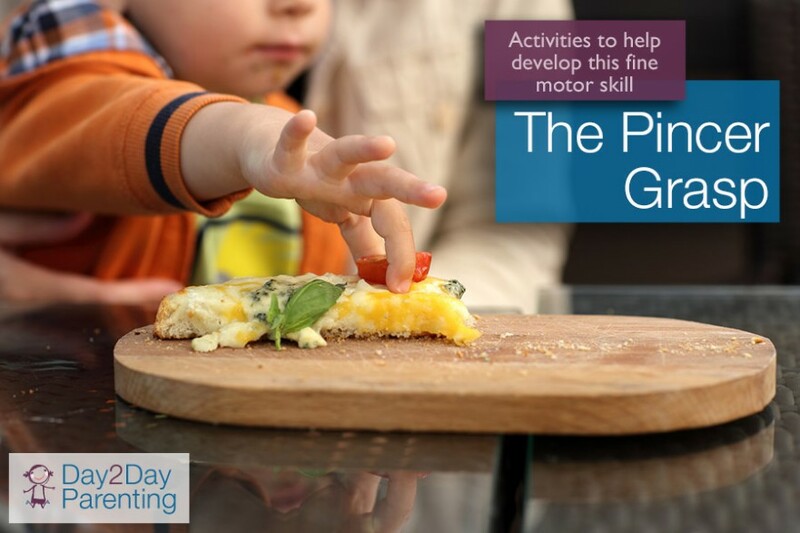 There are many activities you can introduce to help your child gain the pincer grasp skill. Dropping objects into containers will help your child begin to separate the muscle movements of her wrist, hand, and individual fingers. Pointing at, or poking, an object with the index finger is an important first step in the development of the pincer grasp. Encourage your baby to point at pictures in books, her body parts, push holes into play dough, make dents in the carpet, or push and squish foods on her tray to help with this. Play with toys that need to be squeezed, pushed together, or pulled apart will help strengthen the tiny muscles in the hand that are needed for more sophisticated skills later on. Think about bath toys that squirt water, spray bottles, pop beads, large Duplo or Mega Blocks, and Velcro fasteners as great “tools” to help your child develop these muscles and the ability to coordinate them. Placing individual small food items (Cheerios, Goldfish crackers, raisins, mini marshmallows e.g.) inside the compartments of an ice cube tray or egg carton is a great way to challenge your baby to use only his index finger and thumb to get them out. If necessary, you can gently tuck the other three fingers into his palm to help with this. Encourage your baby to pull something out of your pocket, for example a handkerchief that is partially pulled out. Alternatively, encourage him to push something into a pocket, purse, wallet or shoe. Allow your baby the once-in-a-while thrill of pulling every single tissue out of a box of Kleenex, one pinch at a time. 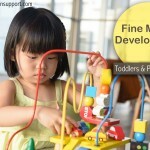 Presenting one or two small things at a time for your baby to pick up is more likely to get him to use a pincer grasp. If there are too many items on the table, he is more likely to try to pick them all up at once and will use a less mature “raking grasp,” gathering as much as possible into his palm with all of his fingers helping. Alexander, R., Boehme, R., & Cupps, B. ( ). Normal development of functional motor skills: The first year of life. Hammill Institute on Disabilities (Austin). Furuno, S., O’Reilly, K. A., Hosaka, C. M., Inatsuka, T. T., Allman, T. L., & Zeisloft, B. (1997). HELP activity guide. VORT Corporation (Palo Alto).